Christopher Horner, a senior fellow at the Competitive Enterprise Institute, has hounded U.S. EPA records relentlessly for years. He is now a member of President-elect Donald Trump's transition team for the agency. Photo courtesy of C-SPAN. Christopher Horner, a relentless hunter of U.S. EPA documents, is now allowed inside the agency's walls. Horner, a senior fellow at the Competitive Enterprise Institute, is a member of President-elect Donald Trump's agency landing team for EPA, the transition team announced Friday. As part of the landing team, Horner can have access to EPA facilities and records — including non-public information, with some restrictions — under a memorandum of understanding signed between the outgoing and incoming administrations. Access to EPA documents is something Horner has always prized. He has hounded EPA for years on all matter of records — emails, text messages and smartphone bills, often from its top brass — first through Freedom of Information Act requests and then frequently by litigation. His biggest discovery was an alternative government email address used by former EPA Administrator Lisa Jackson under the alias "Richard Windsor," named after Jackson's dog and the town where she grew up. The fact that Horner is on Trump's transition team for EPA worries some former agency officials. "I think it's deeply troubling that a guy who has relentlessly pursued the EPA administrator over the legitimate and accepted practice of using an alias for email management purposes would be on the Trump transition team," said Bob Sussman, once a senior policy adviser to Jackson and EPA deputy administrator during the Clinton administration. Horner referred questions from E&E News to the Trump transition team. A transition team spokeswoman said Horner was not available for interviews at this time. Horner's selection for the transition effort was cheered by conservatives active in energy and environmental policy. On Friday, Phil Kerpen, president of free-market group American Commitment, wrote on Twitter, "I would love to see the faces of the rank-and-file when @Chris_C_Horner lands at the EPA." Chris Warren, vice president of communications at the American Energy Alliance, said, "Chris Horner is a great pick." Warren added, "He's worked relentlessly to try to make the EPA more transparent and to uncover misdeeds by the agency. What does the national environmental lobby have against government transparency?" Horner's pursuit of EPA documents also found that Jackson had used a personal email address for official agency business. That led to allegations from Horner and Republican lawmakers that the EPA chief had used the other email accounts to duck FOIA and record-keeping regulations. Nevertheless, EPA's inspector general in September 2013 cleared Jackson and other senior agency officials, saying they didn't use personal email to skirt federal rules (E&E News PM, Sept. 30, 2013). Other findings by the agency watchdog have angered Horner in the past. In July 2014, the IG found that there was no bias against conservative groups regarding who was being assessed FOIA fees by the agency. That finding "strains credulity," Horner said at the time. He was acting as counsel to CEI as well as the Energy & Environment Legal Institute, another conservative-leaning group (Greenwire, July 16, 2014). Sussman said Horner being part of the transition was a bad omen for the agency under Trump. "Horner's record is one of deep hostility to EPA as an institution, and his involvement seems to reflect an inquisitional mindset and not a respectful handoff from one administration to another," Sussman said. Horner's status as a vocal EPA critic stems from his disbelief in climate change science. He has authored books including "Red Hot Lies: How Global Warming Alarmists Use Threats, Fraud and Deception to Keep You Misinformed" and "The Politically Incorrect Guide to Global Warming and Environmentalism." He also has tangled with climate scientists, such as Michael Mann, filing public records requests and then suing for their emails. Horner has testified before Congress, and his EPA records finds have served as fodder for Republicans critical of the agency. Horner earned his law degree from Washington University in St. Louis and is also a senior legal fellow at E&E Legal, which is not affiliated with E&E News. He has never been far from the airwaves or print, having been quoted in several newspapers and even appearing on "The Daily Show with Jon Stewart" back in 2007. Horner has been linked to funding from the coal industry. Bankrupt coal company Alpha Natural Resources Inc. paid him $18,600 between May and July last year. 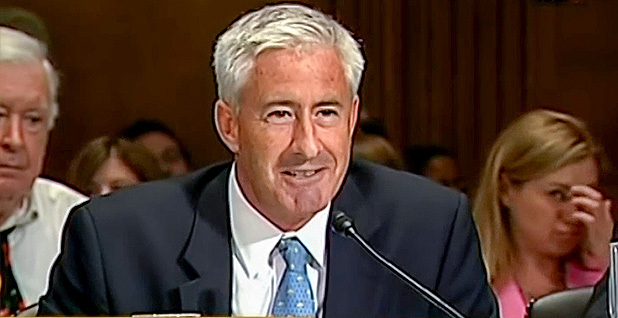 Horner said he was acting as a lawyer for Alpha, adding that "any attempt to draw financial connection between my practice of law and my public policy work is misplaced" (Climatewire, Oct. 19, 2015). Lauren Kurtz, executive director of the Climate Science Legal Defense Fund, has battled Horner in court in the past over climate change scientists' records. She said Horner's spot on Trump's transition team was disturbing. "It is horrifying," Kurtz said. "He is someone who doesn't believe in environmental protections, nor does he accept climate change." But asked about Horner now having access to EPA records, Warren at AEA said, "It's great news for transparency and for good government." Trump has picked several other EPA critics for his agency landing team, including David Schnare, general counsel for E&E Legal. Like Horner, Schnare has used FOIA to embarrass EPA in the past. Kurtz disagreed with Warren's assessment that Horner and others like him being picked for the transition team was a win for transparency. "They put it under this umbrella of being a pro-transparency group and doing it in the public interest. Once they're inside the government, I feel they will continue their bad acts of attacking scientists and dismantling regulations but not continuing their transparency initiatives," Kurtz said.